Our extensible player core allows to playback video in real time with minimal delay. 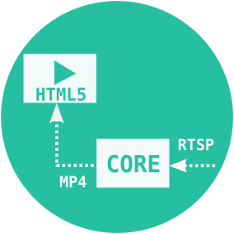 It provides HTML5 video playback of RTSP streams over WebSocket using Media Source Extensions.Our player core can be integrated into most popular HTML5 players with plugins we had developed for you.Playback of an RTSP stream in popular browsers and mobile apps without installation of any software or plugins, right on the HTML page. Proxy implements protocol to communicate with live video source over WebSocket. It should be installed on video source server side to be able to connect to source over TCP. Number of simultaneous connections to proxy is restricted by hardware capabilities. Proxy splits stream into control and data channels. Control channel is used to transmit RTSP-commands while RTP-packets are transferred through data channel. We are developing plugins to integrate our proxy into most famous web servers for users convenience. Plugin adds a specific feature to an existing servers. Our developers hopes that this step will simplify system administration and improve characteristics due to tight interconnection with platform architecture. Output: Playback of RTP media data transcoded into ISO BMFF fragments. There are no restrictions on resolution and stream bitrate. Player is written in ECMAScript2015 and can be easily traspiled into ECMAScript5. Other relatively fresh distributions are also compatible but not tested. For other platform support contact us (link to form). Proxy can be used as standalone system service or as plugin to one of famous web servers like nginx or apache. Playing the RTSP stream in popular browsers using html5 technology without third-party plugins. Access stream from ip camera or other RTSP sources from anywhere with mobile devices. Modular extensible architecture to easy support a lot of formats. with your video stream source before purchasing a license. License plans for one proxy license is assigned to a domain name or to an IP address. unlimited 1 2 free Try it! * If you need to have one license file supporting several Domain names or IP addresses inside, please contact us. It's case when behind the one shared IP address the several domain names are placed. Will I be able to install your player to my php based web site in joomla, WordPress, Drupal and similar CMS or frameworks? How can I play a test stream from my IP camera using your test proxy server? In order to play a video stream from your IP camera it’s necessary to do the stream is available from global Network (Internet) for our test proxy server. If your IP camera is installed inside your subnet it’s necessary to configure your router for passing the stream from internal subnet to global Network. More detailed information how to add a link on your IP camera for player code you can find in the documentation. I have several websites. Can I install the player at all of them? Are there any licensing restrictions? Our Player is free and you can install it on any your websites. It’s necessary to get key on our website (in personal cabinet) for each domain name or IP address where will be used player or proxy. This key is used for communication between the player and the proxy. To enjoy all of this, you need to have a proxy configured on the specified domain name or ip-address. If you need to get more features from the ws proxy, then you can purchase an activation key to activate the extended license for the ws proxy server. This is available in the personal cabinet of the website. Will the player only work with your proxy or can I use other sources of video? Is a critical part of the website development process. It is highly You cannot use other sources as is. The player uses own protocol for interacting with proxy. It is necessary in order to most effectively to split data and control channels as well as to organize the timely delivery of data. Why do you need my domain/ip-address, which you are asking when buying or receiving free proxy player? 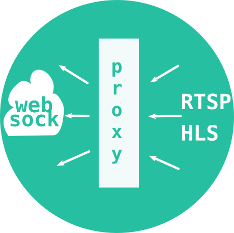 Proxy checks the address of the server from which the request came when establishes connections with the player. This avoids unnecessary strain from untrusted sources. I don't understand how can I choose RTSP or HLS? You need to choose the type of stream and to determine the data transfer protocol on the stage of initialization player. On the side of the proxy you have to install the corresponding protocol support module. More information you can find in the documentation. What can I do for reduce playback delay? Under favorable conditions, the delay in playing back of the fullHD stream is around 1sec. Does player have any limitations for bitrate and image resolution? There are no restrictions. It depends on the performance of the hardware and communication channels. Does the player or proxy decode stream? No, it doesn't. The task of a proxy server is the splitting of input stream into data and control channels and delivery them to the client on selected network protocol. The player receives data and repacks it to mp4 format, which is supported by browsers, without decoding the streams themselves.